“Mood ring materials” are likely to play a significant role in reducing and mitigating damage to the failing infrastructure around the country. The American Society of Civil Engineers has predicted that over $3.6 trillion in investment is required by 2020 to rehabilitate and renovate the failing infrastructure. President-elect Donald Trump plans to set up a $1 trillion infrastructure improvement program when he takes office. A crucial element in any modernization endeavor will be the formulation of new and improved techniques for identifying damage in these structures before it becomes serious. It is here that “mood ring materials’ can be applied. Add nanoparticles into some clear polymer resin and the outcome is “a smart material that changes color when it is damaged or about to fail, what I call a ‘mood ring material,’” explained Cole Brubaker, a doctoral student in civil engineering who is part of an interdisciplinary research team at Vanderbilt University’s Laboratory for Systems Integrity and Reliability (LASIR) developing the new sensing system. Modern sensing technologies are one of the popular new fields in mechanical, civil, and aerospace engineering. These efforts have usually aimed at creating networks of physical sensors that are connected to structures of interest. However, this method has been obstructed by high cost as well as data processing and power demands. The LASIR researchers have chosen to use a different tactic by adding fluorescent nanoparticles into the material itself that react to stress by manipulating their optical properties so as to produce a new kind of detection system that can monitor these structures in a cost-effective and efficient manner. Currently, there are two ways to keep everything from bridges to aircraft safe. One is to send people out to look at them with a flashlight. The problem with this is that it is labor-intensive and the people can’t see very small cracks when they form. The other is to install elaborate sensor networks that constantly look for small cracks and detect them before they grow too large. The problem is that these networks are very expensive and, in the case of aircraft, add a lot of weight. So we need to somehow change the materials we are using so they illuminate these tiny cracks. 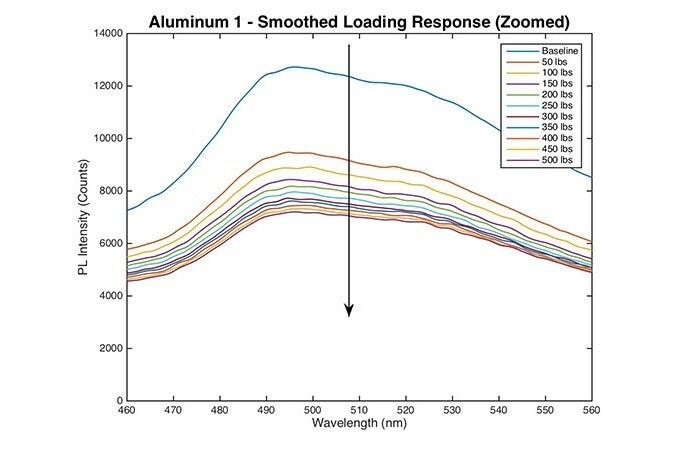 The team’s preliminary studies, published last April in the Proceedings of the SPIE Conference on Sensors and Smart Structures Technologies for Civil, Mechanical and Aerospace Systems, have established that incorporating a minute concentration of special nanoparticles (1 to 5% by weight) to an optically clear polymer matrix creates a unique light signature that changes as the material is subjected to a wide range of tensile and compressive loads. The Vanderbilt team is not the sole research team using nanoparticles to produce smart materials, but they have a special plus point. They are using a specific type of nanoparticle known as a white light quantum dot. These quantum dots are distinctive because they discharge white light where other quantum dots only discharge light at specific wavelengths. These special quantum dots were inadvertently discovered in 2005 in the laboratory of Sandra Rosenthal, Jack and Pamela Egan Professor of Chemistry at Vanderbilt. “We were trying to make the smallest cadmium selenide quantum dots possible and, when we did, we were astonished to discover that they emit in a broad spectrum,” she recalled. White light quantum dots have very unique optical properties compared with other nanoparticles. The white light fluorescence is a surface phenomenon. Now Adam’s expectation has been established by the series of groundwork tests that Brubaker and his colleagues have performed. They have coated aluminum and fiberglass strips with a polymer coating comprising of white light quantum dots and subjected them to different degrees of external load. They have proven that the intensity of the emission spectrum generated by the quantum dots reduces as the load increases. The drop-off is largest with the preliminary loading and slowly reduces at higher levels of load. The mechanism is still a bit unclear, but we have demonstrated that entrapping these quantum dots in ultra-thin polymer films on metal surfaces can provide advance warning when the underlying metal is about to sustain physical or chemical damage. The researchers hypothesize that the quantum dots discharge light in a wide spectrum since over 80% of the atoms are found on the surface. They also are aware that the bonds between the surface atoms and molecules surrounding them play an important role. “The end result is that the strength of the quantum dot emissions gives us a permanent record of the level of stress that a material has experienced,” said Brubaker. In this manner, the team has confirmed that the material can behave as a new kind of strain gauge that permanently records the cumulative quantity of stress that the material to which it is applied experiences. In their first experiments, the researchers have maintained the loads comparatively modest, below 1,250 pounds, well within the elastic limits that the materials can handle without permanent damage. This has given them a baseline that they can apply to compare to the results they gather as they expand to higher loads that result in the materials beginning to fail. The researchers realize that things will become more complicated as they increase the stresses they are applying. For instance, in a set of tests they conducted using epoxy cylinders, which deformed into a barrel shape due to compression, they discovered that the emission spectrum in fact increased, instead of reducing. They theorize that this increase in emission happened because the deformation actually squeezed the nanoparticles tightly together so there were a lot of them within the small area where they were measuring the emission. The team has already come across one of these complications when they analyzed surface coated fiberglass samples. When these samples were loaded under tensile stress, the emissions spectrum reduced much as it did with the aluminum samples until the load touched about 350 pounds. But then it started to climb. They realized that the cracking and popping emitted from the samples, was the point when each fiber in the sample started to break. They theorize that the emission increased because quantum dots that were earlier concealed within the fiberglass matrix were exposed when fibers started to fail. This again raised the quantity of quantum dots within a pre-determined area, causing the general emission level to increase. The LASIR team also understands there is another issue that they will have to resolve to develop a realistic damage detection system. The quantum dots are affected from photo-bleaching. That is, when they are exposed to light they slowly lose their fluorescence in due course. Consequently, the material has to be shielded from external light. The research is being supported by U.S. Office of Naval Research grant N00014-10-1-0958.